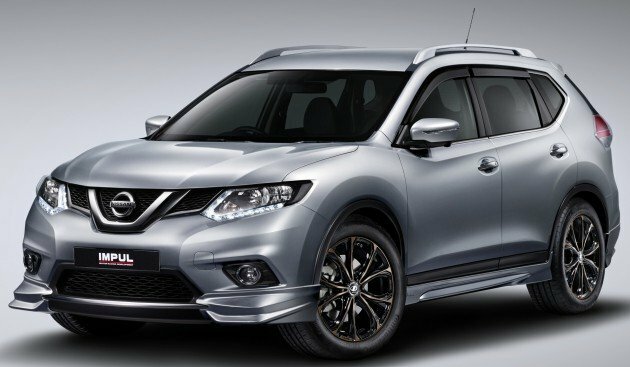 Edaran Tan Chong Motor (ETCM) has officially launched the Nissan X-Trail Tuned by Impul, a new offering for those who desire something a little sportier than the standard seven-seater SUV. The Impul X-Trail package is offered for both the 2.5L 4WD and 2.0L 2WD models. The Impul makeover includes an aerokit made up of newly designed front and rear bumper spoilers, side skirts, door visors, and LED stainless steel kick plates. The 17-inch wheels have also been swapped out for 18-inch Impul Aura SX-50 alloys that get a chrome bronze and gloss black finish. The wheels are wrapped with Continental MaxContact MC5 tyres as well. Additionally, the Impul X-Trail rides 30 mm lower than before thanks to Impul sport springs. 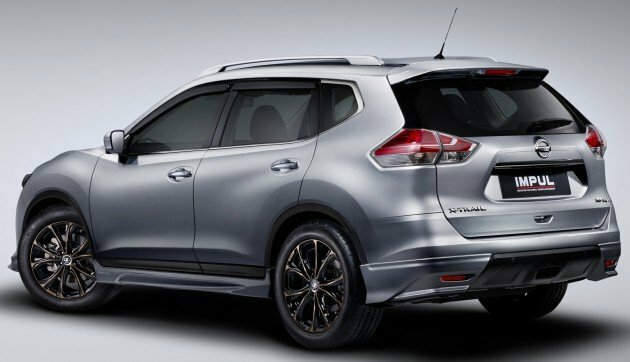 Prices start at RM149,715.05 (OTR with insurance) for the Nissan X-Trail 2.0L 2WD Impul, a premium of RM8,648.04 over the standard 2.0L model (RM141,067.01). The 2.5L 4WD Impul meanwhile, will set you back RM172,516.42 (OTR with insurance), RM8,620.48 more than the standard 2.5L model (RM163,895.94). Aerokit (including front and rear bumper spoilers, side skirts) – RM5,300. Keep in mind that the Impul package doesn’t involve any mechanical changes under the hood of both X-Trail models. Therefore, the 2.0 litre MR20DD direct injection mill is still good for 144 PS at 6,000 rpm and 200 Nm of torque at 4,400 rpm. As for the 2.5 litre, the QR25DE-k2 engine provides 171 PS at 6,000 rpm and 233 Nm at 4,000 rpm for output numbers. Both engines are paired to Nissan’s Xtronic CVT gearbox. Wow, this Impulse thing has just added additional four airbags to this X-trail. Thank you. And Impulse made an SUV to have ground clearance similar to Iris. Not ‘same’. And yes, you mention only look, and your subjective beautiful, that’s all, presumably. WTF??? Additional thousands of precious RMs for cosmetics only??? To be fair, besides cosmetic impul do have their suspension/wheels/tyres upgrade as well. Personally i think this is better than nothing. All these are optional, and no one are forced to purchased it. yep to be honest, it’s still a good addition. at least not so ugly like others give bodykit but rim still small and not lowered. Cosmetics accessories are having good business here. Tons of Wiralution, Wajalution, Myvi, Axia and Vios with huge cosmetic modification out there. Yes, it sounds better if they add a safety system upgrade in the list as well. Please bring in extra safety features as an option first. But, this impul looks great too! Please consider to provide more safety features as an option. Impul looks great but for me, it comes later. Please stop. Just gives us what we want, Nissan Connect and more airbag. Tan Chong purely selling accessories. Crazy high profit margin! not that pricey considering it completely transforms the x-trail into sumthin really awesome looking …. ETCM Malaysia thought Malaysian are fools. X-trail sold in Taiwan n China comes complete with 6 airbags and autonomous hydralic rear boot release. Although they losses the last row of seats (the +2 seven seaters gimmick is pretty useless anyway, not even a 8 year-old boy could sit comfortably at the back. For adults, it’s absolutely touturous to travel in the last row of the X-trial) , they get a more comprehensive car on the safety front and practicality. Here in Malaysia, official Japanese cars distributors always kedekut when it comes to airbag count, the only exception is Mazda Bermaz, which I must give credit to the Zoom Zoom. this is what majority motorists crave desperately, all show no go. I think Nissan Malaysia has terribly missed the point of safety. Bodykit won’t make you this xtrail the bestseller. Extra cosmetic kits wouldn’t save you and your love one live. Seriously Nissan? U have Maslan’s Edition too? Please test drive and tell us whether the lowered springs are worth it – does it improve handling and what’s the trade off in ride comfort? This is the testament that Malaysian drivers only care about look, and nothing about real performance. Which sohai would pay so much only for bodykits?? ?